Many adults find golf to be a pleasurable (and sometimes exasperating!) sport and hope to pass their love of the game onto their children. Golf is a great choice for a variety of reasons possibly the most important of which is that the game can be played all throughout life, giving players opportunities for enjoyable exercise for many years. Even kids as young as two or three can enjoy the basics of golf. They are certainly too young to understand the complexities of the game, but can still have fun playing outside with Mum and Dad, hitting a ball and aiming at a specified target. 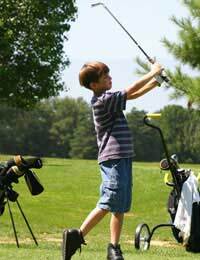 As they get a bit older, many kids can benefit from further practice and instruction. Many parents are quite capable of teaching the basics and even some of the finer points of the game to their children, and for those who do not have the patience to teach, there are plenty of professional golf instructors available. When choosing a golf instructor for children, parents should look for someone who focuses on fun and sportsmanship, rather than merely mastering skills. Especially when they are young, kids need to participate in sports merely for the pleasure and exercise – as long as they are having fun, they will continue to practice and their game will naturally improve. Often, the best way to find a golf teacher is to ask friends and family members for recommendations. Previous clients can paint a realistic picture of the instructor’s attitude, reliability, and ability to help children to be not only skilled, but enthusiastic about the game. Another source of instructor recommendations and instruction is often as close as the local golf course or driving range. Kids’ lessons are often available for beginners as well as for more advanced players. Older kids and teens showing an extraordinary talent for the game may benefit from advanced instruction with a focus on taking their game to the highest level possible. While very few kids will end up playing professionally, most will want to play as well as they are able. Golf clubs can range in price from quite inexpensive to astronomical, even for kids’ sets. For beginners, the most basic sets are usually sufficient, just so parents choose clubs that are properly sized for their children and appropriate for the child’s handedness. As kids grow, their clubs will need to be replaced, so spending a small fortune on those first few sets seems silly (unless, of course, you are raising the next Tiger Woods – then by all means, buy the best!). Some shops offer both new and refurbished sporting equipment, so it’s possible to find good quality children’s golf clubs for a reasonable price if you do a bit of comparison shopping. One of the best qualities of the game of golf is the fact that it lends itself well to players of all ages and abilities. From the youngest family members to Grandma and Grandpa, golf holds appeal for many. Additionally, golf courses are readily available to all but the most rural dwellers, with many of even the nicest courses offering discounts for players who book tee times during non-peak hours. These odd hour games may be especially good for families anyway since those who are still learning the game may not yet be comfortable playing when courses are busy, feeling pressured to “keep up” with the flow of better players. And after all, the most important attribute of any game is its potential for fun!